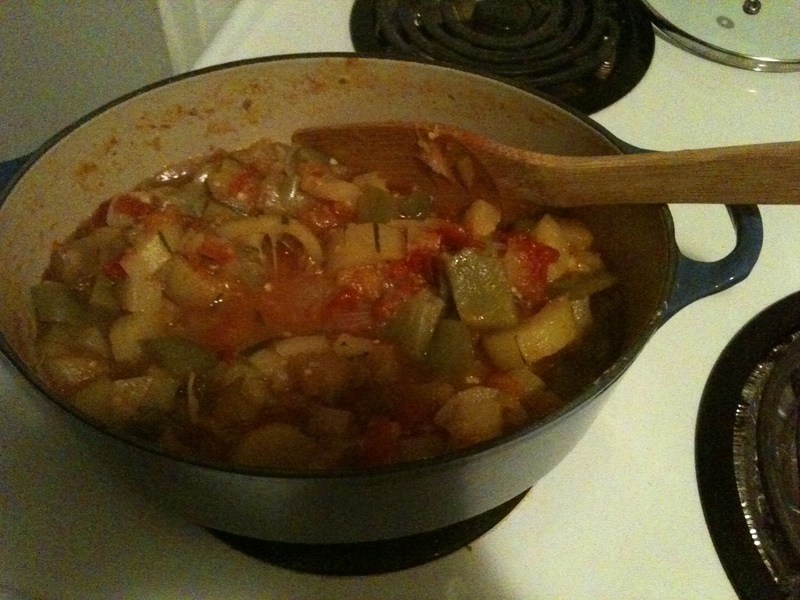 The best thing about Ratatouille is that the whole house will smell as if you are in Nice. Therefore, make it sort of at the last minute so that when the dinner guests arrive, they will become instantly ravenous. Most of the work is chopping the vegetables, so get out a large wooden board and your best knife. Touch up the sharpening so the knife does not slip and cuts innocent fingers. If you do not have sharpening tools, just use the blade of another knife and rub both blades along each other almost parallel alternating the top and bottom blades. Ingredients: They are to be put in your biggest Cocotte Le Creuset containing for 4 tbsp olive oil in order to prevent burning. Four/five ripe tomatoes diced, 1 onion sliced, 2 green peppers cut in squares, 2 cloves garlic minced, 2 zucchini cut in half lengthwise and sliced, 1 eggplant peeled cut in quarters lengthwise and sliced. 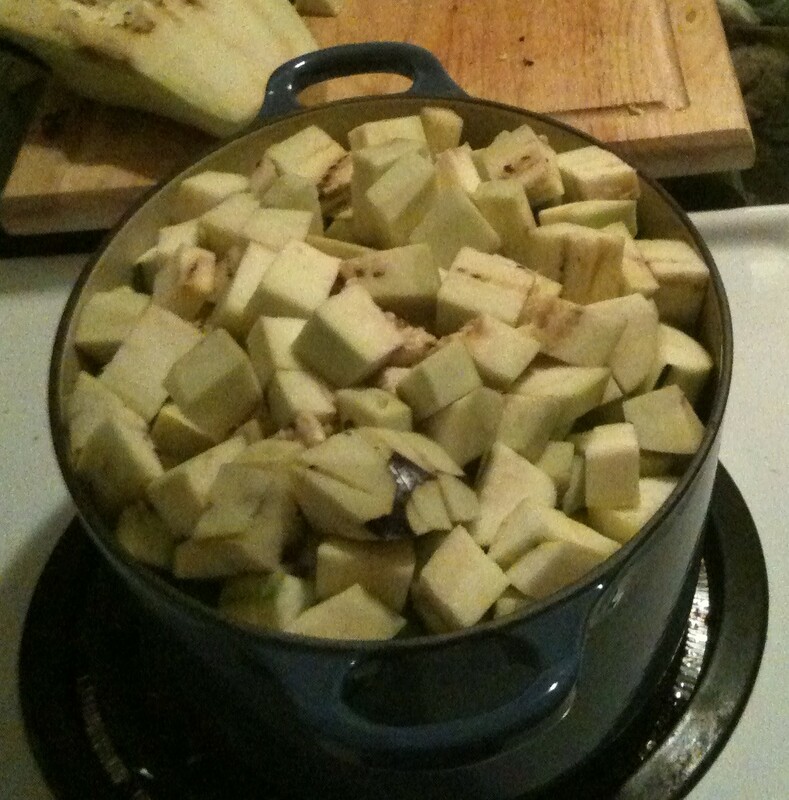 Add a small bayleaf, thyme or herbes de Provence, salt. Adding salt is necessary as it will make the water come out of the vegetables and prevent burning. Simmer on low with a lid 5 minutes. Then, stir as needed. When you see too much liquid, simmer without a lid. About half way through the cooking add 2 more diced tomatoes since the original tomatoes are now part of the sauce. Remove the bayleaf before serving. 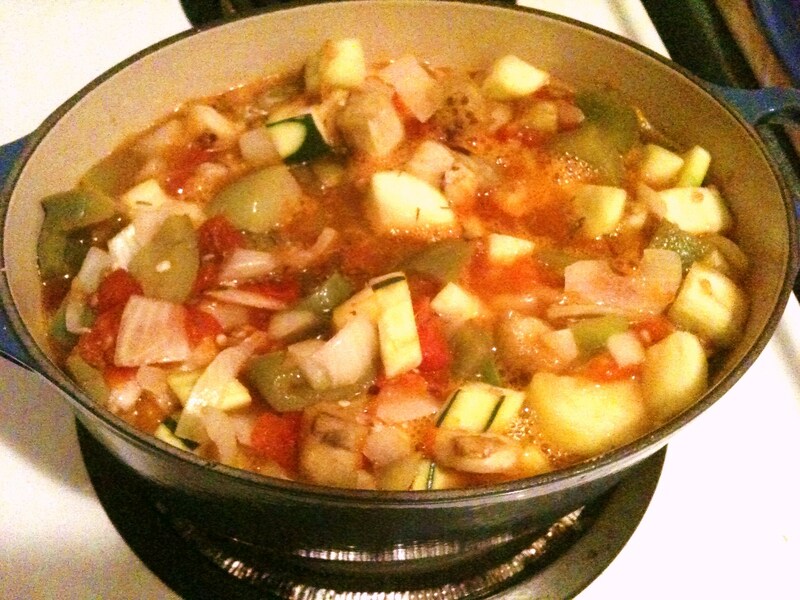 Note: Ratatouille is a vegetable stew and it should be somewhat mushy, no al dente vegetables. Otherwise, you have made roasted vegetables (not ratatouille). I peel the eggplant because most eggplants have very hard skins but that’s optional. My mom also peels the zucchini, I don’t. Sometimes I add pitted black olives and although it is not the traditional recipe, it is worth doing especially in the winter when the vegetables and tomatoes are not as tasty as in Provence. You can also replace the thyme with fresh basil. 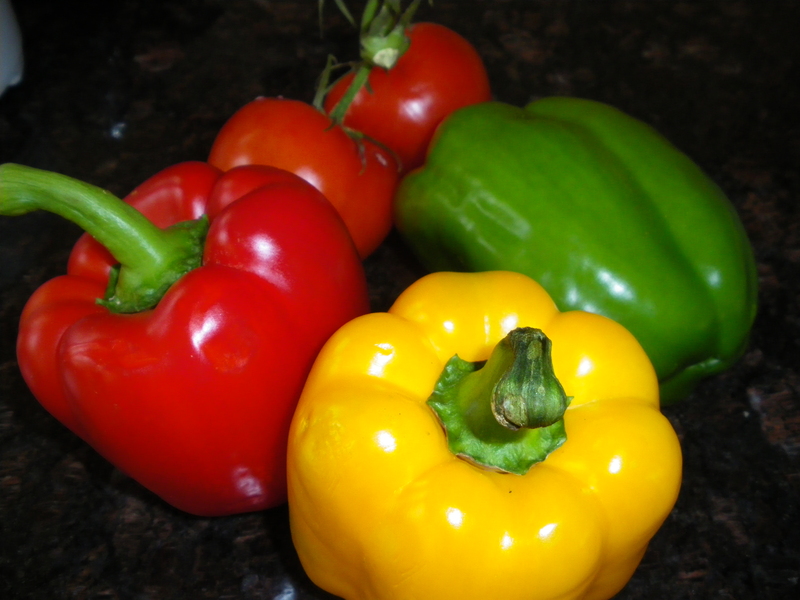 Green peppers can be replaced with yellow, orange, or red peppers, but the taste will be slightly different. 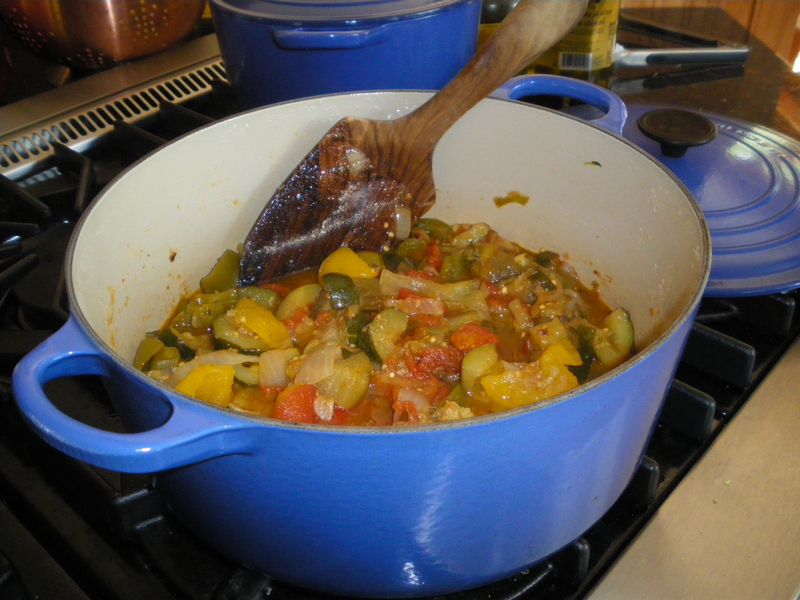 Ratatouille as a vegetarian meal: In the Cocotte Le Creuset, add 4 tbsp Olive oil, 1 cup Italian white rice, stir the rice on medium for 3 minutes then add the tomatoes and onion, stir another 2 minutes. Add a cup of water and all the other veggies. Finish the same with a lid on. The rice will absorb the extra liquid. Keep an eye so it does not burn. Add more water if required. Tip: if the courgette (zucchini) and aubergine (eggplant) are big, I recommend to remove some of the seeds before cooking. This entry was posted in Vegetables and tagged cocotte, eggplant, Le Creuset, peppers, Provence, ratatouille, recipes, verygoodrecipe, zuchini. Bookmark the permalink. I love ratatouille, but I have never thought to put it in a pie, so I am going to try this, no doubt. I looks delicious! Such a good way to use left-overs that no one eats in my family. But my favourite is still the tomato pie and you have such good tomatoes in Ontario right now.